We're about to spend the entire weekend driving, so instead of a real article, I'm leaving you with one of my favorite (and public domain!) short horror stories along with the classic Toho film inspired by it. The Voice in the Night is one of William Hope Hodgson's eeriest tales, and that's saying something for an author who wrote a story in which drowned corpses are animated by deep sea worms and another story featuring a giant, malevolent pig made out of psychic gas, to name a few. That Lovecraft is seen as the face of "weird horror" is kind of criminal when Hodgson's work came fully decades earlier, and I really think does a much better job of expressing the dread of the bizarre and unknown. Over half a century after its publication, the story was adapted by Toho studios in a surprise break from giant-size monster movies, and inexplicably appears to this day in lists of "cheesy" or "absurd" cinema. Matango is not a "B-movie." Even with a cast that notoriously mirrors that of Gilligan's Island (before the show ever premiered), the original, full Japanese film is a well directed, beautifully atmospheric horror with a slow, steady pace and truly haunting monsters that could never have captured such a perfect fever-dream uncanniness with more modern cinematic technology. There's currently only one place you can watch this film for free in its original form, with English subtitles, and you're probably not supposed to, but here is the link if you've also got an adblocker enabled. The original short story follows in its entirety...but whether you read Hodgson's version or watch Toho's adaptation first is up to you! With there being no wind, we had steadied the tiller, and I was the only man on deck. The crew, consisting of two men and a boy, were sleeping forrard in their den; while Will — my friend, and the master of our little craft — was aft in his bunk on the port side of the little cabin. The pause sounded oddly; but it was only afterwards that it came back to me with any significance. “I— I— can’t. It wouldn’t be safe. I——” The voice broke off, and there was silence. I listened for a moment; but there came no answer. And then, a sudden indefinite suspicion, of I knew not what, coming to me, I stepped swiftly to the binnacle, and took out the lighted lamp. At the same time, I knocked on the deck with my heel to waken Will. Then I was back at the side, throwing the yellow funnel of light out into the silent immensity beyond our rail. As I did so, I heard a slight, muffled cry, and then the sound of a splash as though someone had dipped oars abruptly. Yet I cannot say that I saw anything with certainty; save, it seemed to me, that with the first flash of the light, there had been something upon the waters, where now there was nothing. From a long distance away there came back to us a faint reply, and my companion repeated his call. Presently, after a short period of silence, there grew on our hearing the muffled sound of oars; at which Will hailed again. “Come nearer,” he said, and the oar-strokes continued. Then, when apparently some half-dozen fathoms distant, they again ceased. “Because ——” began the voice, and stopped short. Will put his hand on my shoulder. He leant more over the rail. “Shove that lamp back in the binnacle,” said Will; then he leaned over the rail and listened. I replaced the lamp, and came back to his side. The dipping of the oars ceased some dozen yards distant. “That’s all right,” said Will, and hesitated. “You’re welcome to as much grub as you can take ——” Again he hesitated. “You are very good,” exclaimed the voice. “May God, Who understands everything, reward you ——” It broke off huskily. “I know not its name,” returned the voice. “I would to God ——!” it began, and checked itself as suddenly. “No — I DARE NOT,” replied the voice, and it seemed to me that in its tones I detected a note of stifled craving — as though the owner hushed a mortal desire. It came to me then in a flash, that the poor old creature out there in the darkness, was SUFFERING for actual need of that which Will held in his arms; and yet, because of some unintelligible dread, refraining from dashing to the side of our little schooner, and receiving it. And with the lightning-like conviction, there came the knowledge that the Invisible was not mad; but sanely facing some intolerable horror. This we did — propelling it away from the vessel, out into the darkness, by means of a boathook. In a minute, a slight cry from the Invisible came to us, and we knew that he had secured the box. A little later, he called out a farewell to us, and so heartful a blessing, that I am sure we were the better for it. Then, without more ado, we heard the ply of oars across the darkness. And so the time slipped away — an hour, another, and still Will stayed with me; for the queer adventure had knocked all desire for sleep out of him. The third hour was three parts through, when we heard again the sound of oars across the silent ocean. “Yes,” answered the voice. “But some few degrees to the North of the line she was caught in a terrible storm, and dismasted. When the day came, it was found that she was leaking badly, and, presently, it falling to a calm, the sailors took to the boats, leaving — leaving a young lady — my fiancée — and myself upon the wreck. “We were below, gathering together a few of our belongings, when they left. They were entirely callous, through fear, and when we came up upon the deck, we saw them only as small shapes afar off upon the horizon. Yet we did not despair, but set to work and constructed a small raft. Upon this we put such few matters as it would hold including a quantity of water and some ship’s biscuit. Then, the vessel being very deep in the water, we got ourselves on to the raft, and pushed off. “When the morning came, we found that we were in a sort of great lagoon; but of this we noticed little at the time; for close before us, through the enshrouding mist, loomed the hull of a large sailing-vessel. With one accord, we fell upon our knees and thanked God; for we thought that here was an end to our perils. We had much to learn. “The raft drew near to the ship, and we shouted on them to take us aboard; but none answered. Presently the raft touched against the side of the vessel, and, seeing a rope hanging downwards, I seized it and began to climb. Yet I had much ado to make my way up, because of a kind of grey, lichenous fungus which had seized upon the rope, and which blotched the side of the ship lividly. “I reached the rail and clambered over it, on to the deck. Here I saw that the decks were covered, in great patches, with grey masses, some of them rising into nodules several feet in height; but at the time I thought less of this matter than of the possibility of there being people aboard the ship. I shouted; but none answered. Then I went to the door below the poop deck. I opened it, and peered in. There was a great smell of staleness, so that I knew in a moment that nothing living was within, and with the knowledge, I shut the door quickly; for I felt suddenly lonely. “I went back to the side where I had scrambled up. My — my sweetheart was still sitting quietly upon the raft. Seeing me look down she called up to know whether there were any aboard of the ship. I replied that the vessel had the appearance of having been long deserted; but that if she would wait a little I would see whether there was anything in the shape of a ladder by which she could ascend to the deck. Then we would make a search through the vessel together. A little later, on the opposite side of the decks, I found a rope side-ladder. This I carried across, and a minute afterwards she was beside me. “Together we explored the cabins and apartments in the after part of the ship; but nowhere was there any sign of life. Here and there within the cabins themselves, we came across odd patches of that queer fungus; but this, as my sweetheart said, could be cleansed away. “In the end, having assured ourselves that the after portion of the vessel was empty, we picked our ways to the bows, between the ugly grey nodules of that strange growth; and here we made a further search which told us that there was indeed none aboard but ourselves. “This being now beyond any doubt, we returned to the stern of the ship and proceeded to make ourselves as comfortable as possible. Together we cleared out and cleaned two of the cabins: and after that I made examination whether there was anything eatable in the ship. This I soon found was so, and thanked God in my heart for His goodness. In addition to this I discovered the whereabouts of the fresh-water pump, and having fixed it I found the water drinkable, though somewhat unpleasant to the taste. “For several days we stayed aboard the ship, without attempting to get to the shore. We were busily engaged in making the place habitable. Yet even thus early we became aware that our lot was even less to be desired than might have been imagined; for though, as a first step, we scraped away the odd patches of growth that studded the floors and walls of the cabins and saloon, yet they returned almost to their original size within the space of twenty-four hours, which not only discouraged us, but gave us a feeling of vague unease. “Still we would not admit ourselves beaten, so set to work afresh, and not only scraped away the fungus, but soaked the places where it had been, with carbolic, a can-full of which I had found in the pantry. Yet, by the end of the week the growth had returned in full strength, and, in addition, it had spread to other places, as though our touching it had allowed germs from it to travel elsewhere. “On the seventh morning, my sweetheart woke to find a small patch of it growing on her pillow, close to her face. At that, she came to me, so soon as she could get her garments upon her. I was in the galley at the time lighting the fire for breakfast. “Come here, John,” she said, and led me aft. When I saw the thing upon her pillow I shuddered, and then and there we agreed to go right out of the ship and see whether we could not fare to make ourselves more comfortable ashore. “Hurriedly we gathered together our few belongings, and even among these I found that the fungus had been at work; for one of her shawls had a little lump of it growing near one edge. I threw the whole thing over the side, without saying anything to her. “The raft was still alongside, but it was too clumsy to guide, and I lowered down a small boat that hung across the stern, and in this we made our way to the shore. Yet, as we drew near to it, I became gradually aware that here the vile fungus, which had driven us from the ship, was growing riot. In places it rose into horrible, fantastic mounds, which seemed almost to quiver, as with a quiet life, when the wind blew across them. Here and there it took on the forms of vast fingers, and in others it just spread out flat and smooth and treacherous. Odd places, it appeared as grotesque stunted trees, seeming extraordinarily kinked and gnarled — the whole quaking vilely at times. “It is difficult to make you understand how cheered we were to find one place that was absolutely free from the growth, and here we deposited our belongings. Then we went back to the ship for such things as it seemed to us we should need. Among other matters, I managed to bring ashore with me one of the ship’s sails, with which I constructed two small tents, which, though exceedingly rough-shaped, served the purpose for which they were intended. In these we lived and stored our various necessities, and thus for a matter of some four weeks all went smoothly and without particular unhappiness. Indeed, I may say with much of happiness — for — for we were together. “It was on the thumb of her right hand that the growth first showed. It was only a small circular spot, much like a little grey mole. My God! how the fear leapt to my heart when she showed me the place. We cleansed it, between us, washing it with carbolic and water. In the morning of the following day she showed her hand to me again. The grey warty thing had returned. For a little while, we looked at one another in silence. Then, still wordless, we started again to remove it. In the midst of the operation she spoke suddenly. “‘What’s that on the side of your face, dear?’ Her voice was sharp with anxiety. I put my hand up to feel. “‘There! Under the hair by your ear. A little to the front a bit.’ My finger rested upon the place, and then I knew. “‘Let us get your thumb done first,’ I said. And she submitted, only because she was afraid to touch me until it was cleansed. I finished washing and disinfecting her thumb, and then she turned to my face. After it was finished we sat together and talked awhile of many things for there had come into our lives sudden, very terrible thoughts. We were, all at once, afraid of something worse than death. We spoke of loading the boat with provisions and water and making our way out on to the sea; yet we were helpless, for many causes, and — and the growth had attacked us already. We decided to stay. God would do with us what was His will. We would wait. “Occasionally we ventured off to the ship for such stores as we needed. There we found that the fungus grew persistently. One of the nodules on the maindeck became soon as high as my head. “As I was saying, we knew that we should have to use care in the matter of food. But we had no idea then how little food there was left of which to take care. It was a week later that I made the discovery that all the other bread tanks — which I had supposed full — were empty, and that (beyond odd tins of vegetables and meat, and some other matters) we had nothing on which to depend, but the bread in the tank which I had already opened. “Here, at times, I caught odd fish; but so infrequently that they proved of but little help in keeping us from the hunger which threatened. It seemed to me that our deaths were likely to come by hunger, and not by the growth of the thing which had seized upon our bodies. “We were in this state of mind when the fourth month wore out. When I made a very horrible discovery. One morning, a little before midday. I came off from the ship with a portion of the biscuits which were left. In the mouth of her tent I saw my sweetheart sitting, eating something. “‘What is it, my dear?’ I called out as I leapt ashore. Yet, on hearing my voice, she seemed confused, and, turning, slyly threw something towards the edge of the little clearing. It fell short, and a vague suspicion having arisen within me, I walked across and picked it up. It was a piece of the grey fungus. “As I went to her with it in my hand, she turned deadly pale; then rose red. “‘My dear! My dear!’ I said, and could say no more. Yet at words she broke down and cried bitterly. Gradually, as she calmed, I got from her the news that she had tried it the preceding day, and — and liked it. I got her to promise on her knees not to touch it again, however great our hunger. After she had promised she told me that the desire for it had come suddenly, and that, until the moment of desire, she had experienced nothing towards it but the most extreme repulsion. 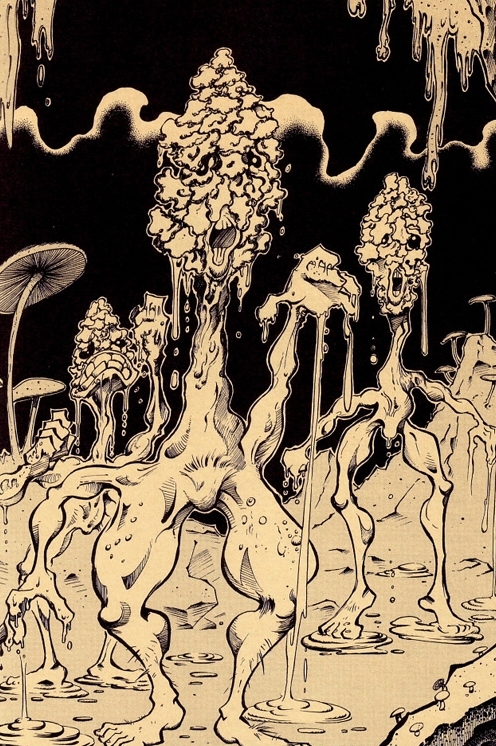 “Later in the day, feeling strangely restless, and much shaken with the thing which I had discovered, I made my way along one of the twisted paths — formed by the white, sand-like substance — which led among the fungoid growth. I had, once before, ventured along there; but not to any great distance. This time, being involved in perplexing thought, I went much further than hitherto. “Suddenly I was called to myself by a queer hoarse sound on my left. Turning quickly I saw that there was movement among an extraordinarily shaped mass of fungus, close to my elbow. It was swaying uneasily, as though it possessed life of its own. Abruptly, as I stared, the thought came to me that the thing had a grotesque resemblance to the figure of a distorted human creature. Even as the fancy flashed into my brain, there was a slight, sickening noise of tearing, and I saw that one of the branch-like arms was detaching itself from the surrounding grey masses, and coming towards me. The head of the thing — a shapeless grey ball, inclined in my direction. I stood stupidly, and the vile arm brushed across my face. I gave out a frightened cry, and ran back a few paces. There was a sweetish taste upon my lips where the thing had touched me. I licked them, and was immediately filled with an inhuman desire. I turned and seized a mass of the fungus. Then more and — more. I was insatiable. In the midst of devouring, the remembrance of the morning’s discovery swept into my mazed brain. It was sent by God. I dashed the fragment I held to the ground. Then, utterly wretched and feeling a dreadful guiltiness, I made my way back to the little encampment. “I think she knew, by some marvellous intuition which love must have given, so soon as she set eyes on me. Her quiet sympathy made it easier for me, and I told her of my sudden weakness; yet omitted to mention the extraordinary thing which had gone before. I desired to spare her all unnecessary terror. “But, for myself, I had added an intolerable knowledge, to breed an incessant terror in my brain; for I doubted not but that I had seen the end of one of those men who had come to the island in the ship in the lagoon; and in that monstrous ending I had seen our own. “Thereafter we kept from the abominable food, though the desire for it had entered into our blood. Yet our drear punishment was upon us; for, day by day, with monstrous rapidity, the fungoid growth took hold of our poor bodies. Nothing we could do would check it materially, and so — and so — we who had been human, became —— Well, it matters less each day. Only — only we had been man and maid! “And day by day the fight is more dreadful, to withstand the hungerlust for the terrible lichen. There was the dip of an oar — another. Then the voice came again, and for the last time, sounding through the slight surrounding mist, ghostly and mournful. “Good-bye,” we shouted together, hoarsely, our hearts full of many emotions. The sun flung a stray beam across the hidden sea; pierced the mist dully, and lit up the receding boat with a gloomy fire. Indistinctly I saw something nodding between the oars. I thought of a sponge — a great, grey nodding sponge — The oars continued to ply. They were grey — as was the boat — and my eyes searched a moment vainly for the conjunction of hand and oar. My gaze flashed back to the — head. It nodded forward as the oars went backward for the stroke. Then the oars were dipped, the boat shot out of the patch of light, and the — the thing went nodding into the mist.